This is not only a story of slavery and the European Trans-Atlantic Slave Trade. This is a new telling of an old story of how Africans arrived in early America, but from the perspective of its living, vibrant settlers, whose viewpoint has largely been ignored. We believe far too many historical discussions of the European Slave Trade and slavery have overshadowed the stories of the Africans and later African Americans as a people, rendering their past lives and accomplishments nearly invisible to the present-day audience. Our mission is to create greater visibility and awareness of the vast contributions that African men and women have made to American history. It is our hope the sharing of the creative survival and perseverance of the early Africans of Newport will help today’s generation better understand and take pride in their own unique American heritage. We created this web site for the purpose of racial justice, learning, and reconciliation and most importantly, to reconnect persons of African heritage today with their ancestors who contributed greatly to the settlement and building of early America. Cemeteries are largely seen as final resting places – an end. For us, and hopefully for you, God’s Little Acre is the beginning point to a rich cultural tapestry that is Newport’s African and African American history. The European Slave Trade and Newport, Rhode Island, share common origins. Newport, one of the most prosperous of Colonial American seaports, experienced unprecedented growth throughout the 18th century; mostly from the export and trade of rum, spermaceti candles and slaves. Many of the enslaved Africans came from the Guinea, Gold, and Cape Coasts of West Africa. Many would also arrive through Charleston, South Carolina and the sugar plantations of the West Indies particularly Barbados, Jamaica & Antigua. By the beginning of the American Revolution, Newport had a sizable free African community. Within the next decade these Africans would establish America’s first Free African Union Society in 1780. One critical activity of the Society was to record the birth and death records of Newport’s African community. The Society also ensured proper burials with markers in the originally segregated section of the larger Common Burying Ground. 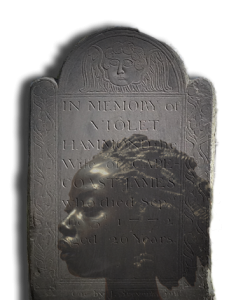 Today, Newport is home to a historically noteworthy burying ground that the African and African American community commonly called “God’s Little Acre.” This burial area on Farewell Street has been recognized as having possibly the oldest and largest surviving collection of markers of enslaved and free Africans, the earliest of whom were born in the late 1600’s. 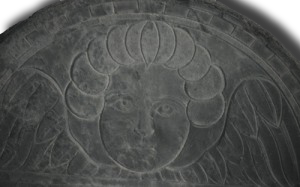 When studying early American burial markers, it is important to recognize that only the privileged few of that time could afford the luxury of providing a stone maker for their dearly departed. The fact that so many markers were cut for both enslaved and later free Africans is a remarkable testament of African identity, perseverance and memory in Colonial Newport. It is also the place where we find the work of enslaved stonemasons with names like Pompe and Zingo and perhaps the first artwork signed by an African American: at least two of the surviving stones are signed by Pompe Stevens, a stonecutter who worked from the Stevens family stone shop during the 18th century. As you view the markers, several of which document African persons who lived over 300 years ago, you will find that many are in deep disrepair. There is a great chance these markers may be lost forever. Please join us in viewing this web site and the effort to preserve and interpret this important part of our American heritage.